THE SAN DIEGO SURF FILM FESTIVAL RETURNS TO CELEBRATE AND UNITE SURF COMMUNITIES FROM AROUND THE WORLD. Over a dozen of the finest international surf films vie for top honors with eager filmmakers and film stars descending upon San Diego Thursday, May 9th to Saturday, May 11th for the much anticipated annual San Diego Surf Film Festival. The festival which was started as a grassroots campaign to celebrate surf filmmaking and our local surf community has elevated itself to one of the most prestigious surf film festivals in the world with surfing royalty showing up every year. You never know who you will be sitting next to you…Tom Curren, Taylor Steele, Paige Alms, Skip Frye, Jen Smith, Shaun Tomson, Tiare Thompson or the next World Champion. Highlights of the San Diego Surf Film Festival 2019 include an Opening Night at the Belly Up Tavern featuring films. live art, silent auction and live music from Chris Cote, The Montalban Quintet and The Voices. An incredible Farm to Table seven-course, organic dinner at Cyclops Farms in Oceanside with a Special Slideshow Presentation from world-renown surf photographer Grant Ellis prior to a set of films viewed under the stars. A photo exhibit from Oriana Poindexter featuring Treasures from the Scripps Collection. In addition, Featured Artist Fay Wyles assembled a team of incredible artists to create live art at all the major SDSFF events this year in what has become one of the most sought after aspects of the festival. 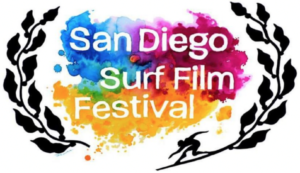 With the return of the 7th Annual San Diego Surf Film Festival one can only ask themselves what new could possibly be done by a hometown festival which brings together some of the most renown names in surf filmmaking let alone the surf world year after year. 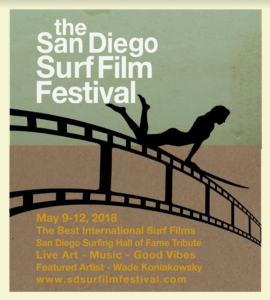 The San Diego Surfing Film Festival 2018 runs May 9-12th at over a dozen locations around San Diego with it’s hub being the Misfit Gallery in La Jolla. 15 of the best international surf films are presented over the 4 day festival with highlights including Nathan Oldfield’s “Church of the Open Sky”, Taylor Steele’s “Proximity” and Nathan Curren and Pierre Denoyel’s “Biarritz Surf Gang” among many others. The SDSFF 2018 kicks off Wednesday, May 9th 6pm at featured artist Wade Koniakowsky’s Art Gallery in Solana Beach in what has been described as having a Live Art Beach Party vibe with some of California’s foremost surf artists. Thursday, May 10th is the highly-anticipated San Diego Surfing Hall of Fame Induction Ballot Dinner Ceremony emceed by Hank Warner at the La Jolla Community Center. Over a dozen local eateries have come together to create a special tasting menu to be paired with beer, wine and kombucha in what looks like an incredibly memorable evening amongst the legends of San Diego Surfing. Friday and Saturday, May 11th and 12th include the majority of the SDSFF Films with Special Events running throughout the day and evenings.